Ok, I confess. I love fat! It makes me feel full, keeps me from being hungry again in 60 minutes or less, and aided me in the loss of 18 pounds and I have kept it all off! This was all weight that I gained in the eat low fat, high carbohydrates days. You know the days I speak of... "follow the USDA Pyramid and eat lots of grains" mentality that has turned the USA into a country of even heavier people. 6-11 servings of grains, oh my! I am feeling like a grain fed heifer just thinking of it! The pyramid below emphasizes vegetables as the base of the pyramid, meaning our meals should be based around vegetables, not grains. Now this is a bandwagon I can jump on, as long as my veggies have a 'lil grass fed butter on them. There are so many food pyramids available for reference: vegetarian, vegan, Asian, Latin American, African, Mediterranean... the list is quite extensive. Oldways, a nonprofit food and nutrition education organization, with a mission to guide people to good health through heritage, has several versions of traditional diet food pyramids: http://oldwayspt.org/resources/heritage-pyramids/why-pyramids-are-important. Fat, that's my answer to weight loss. Now, do not think I am sitting about peeling and eating sticks of butter like a banana. But, I do not shy away from high fats foods, or butter, for that matter! Well, truthfully, fat is just one of my answers to weight loss. I guess I should say that the fat is part of a whole food diet, based around locally grown foods, eaten in the season they grow and/or can be stored. There are many good fats out there from nuts and seeds, extra virgin olive oil, avocados, dairy products from naturally fed cows, meat from grass fed animals, eggs from pasture raised chickens... the list goes on. Are they all available locally? No, no they are not. Create your own plan around what you are comfortable with in regards to food and where it comes from: avocados from California or Mexico, olives and olive oil from California or Italy, grass fed butter from Wisconsin or Ireland? How to get Fats from Food not Supplements I am not big on supplements, they are factory made and I run from factory made food... why would I embrace factory made supplements? With that said, I do recommend some supplements, some of the time, especially those that are 100% whole food, whole herb, etc. Where do we get good fats? From good foods, of course!! Always remember, fat is a dense, highly concentrated food. Eating it in moderation is best. ANIMAL SOURCES: If you are eating healthy animal products: from animals raised and fed naturally, running about the fields eating what they would naturally eat, not being fed the packaged, processed foods that are manufactured for animals by factories owned by corporations. (Does this sound familiar?) If animals are living natural Whole Health Lifestyles, eating the natural Whole Food meant for their species.... their bodies are going to be radiantly, vibrantly healthy! They are going to produce eggs, dairy and muscles, (meat), and organ meats that are healthy. If you eat healthy animal products, they will have a healthy effect in your body. The reverse is also true; eat unhealthy animal products from animals not living whole health, whole food lifestyles and these animal products make you unhealthy. Butter and fat from grass fed, naturally fed animals is loaded with healthy fats and vitamin D. This includes lard, yes lard! Not from factory farmed, grain fed, feed lot animals though! You want to eat animal products from animals raised as naturally as possible. No, these are not local, but a source of good fats from whole foods, not supplements. These fish have to be WILD. If it is farmed salmon or farmed fish they have been fed un-natural diets (grains and manufactured fish food pellets), kept in un-natural captivity, and given antibiotics and hormones. These things do not make their bodies healthy, nor will they make yours healthy. Avoid large predator fish: swordfish, tuna, etc... They are top of the food chain and are high in toxins like mercury. Most fish are not a local food. Make your food choices, local or not, that work for you. PLANT SOURCES: Walnuts, flax seeds, chia seeds, hemp seeds, pumpkin seeds, dark green leafy veggies, and purslane. Most plant sources of food have some amount of fat, even if tiny amounts. If you make smoothies, you can add the raw seeds and walnuts to the smoothie. Blend well to fine grind the nuts and seeds. Another option is to pre-grind nuts and seeds. A coffee grinder works well. Then sprinkle them on granola, stir fries, soups and stews, plain yogurt and fruit, and add them (pre-ground) to your smoothie. Other great plant sources of healthy fats: whole olives, cold pressed extra virgin olive oil, avocado, coconut, unrefined coconut oil in moderation, all nuts and seeds. Cold pressed sesame oil for cooking. Cold pressed walnut oil for salad dressings. Buy RAW nuts and seeds, not the roasted / salted / sugar sweetened varities. Peanuts, which are really a legume / bean, should be roasted. Most of these are not local, obviously. I do use organic, extra virgin olive oil for making salad dressing. Butter just does not work well! Before the heavy importation of olive oil, local people made salad dressings from the cream, off of the top of the milk, from the cow in their back yards. Fat is yummy. Eat whole food sources, in moderation and enjoy!! I also recommend, as with all food, to get your fat sources as locally as possible despite the global food advertising urging to eat coconut oil, etc. Healthy bodies are all about whole food eating, whole health living, period!!! I cut and pasted this below section from my book, Hands On Health, as my explanation of fats. These are my thoughts and opinions on fats from many years of working in nutrition and health. As I always tell people: read, learn, form your own opinions and truths that work for you. Bottom line: eat whole foods raised 100% naturally, you can’t go wrong with nature. I like to compare grass-fed land animals to the “eat wild fish” agenda that has been popular for some time. (See wild salmon information above.) We are told how the fats in wild Alaskan salmon and other deep, cold-water ocean fish are good for us. Are fish really the only animals that can eat their natural diets and turn this natural food into healthy fat that is good for both the fish's health and for the humans who choose to eat them? It does not make a bit of sense to me that fish are the only living creatures capable of this feat. I believe that all animals, eating their natural diets, uninterrupted by humans’ manufactured “food products” are producing 100% healthy bodies, their fat included. Warning: farm-raised salmon and other fish are unhealthy. They are fed unnatural diets creating unhealthy bodies with unhealthy fat profiles. Tampering with nature does not pay off! The question arises: between animal and plant based fats, which one is healthier? I have my thoughts and theories here too. (Bet you are surprised!) If the animals are raised naturally, their fat in moderation is not unhealthy in our diets. Peeling a stick of butter and eating it like a banana is not moderation! I will repeat my thoughts here on plant-based fats: they are also best in their whole, natural state: avocados over avocado oil, olives over olive oil, nuts and seeds over their oils. These plants need to be raised organically and sustainably, so they contain the full array of nutrients that nature intended. My thoughts on saturated vs. unsaturated fats. Saturated fats (butter, lard, coconut, etc.) are solid at room temperature while most vegetable fats are liquid at room temperature. Average room temperature is somewhere around 60 to 70 degrees F. The average body temperature is a bit higher than that, say somewhere around 98.6 F. Where does that leave solid fats in this huge temperature discrepancy? I have to assume any animal fat that is solid at 60 to 70 degrees is going to look and function a bit differently at 98.6 degrees. I don’t know; I could be wrong. Writer’s Disclaimer: The writer’s knowledge and experiences are not necessarily shared, nor have they been evaluated or approved by the F.D.A., the A.M.A., or any other agency. My theories, beliefs and hypotheses come from 25 plus years of studying and working in natural nutrition and healing. Eat butter and fat at your own risk and pleasure - I do! *Introduce yourself to a local brand of yogurt, Prosper's Farmstead Creamery Artisan Yogurt. I have had great conversations with Jessica Prosper on grass fed dairy cattle in Northern NY. It gets cold here... remember that fact! I like her solid, common sense answer about giving cows a little bit of grain in order for the cows to thrive in our northern NY weather.
" I know you use my product which is mostly grassfed, but not 100%. The point that I would like you to be aware of, that I think is very important since you are an educator and an expert that people listen to, is that from an animal welfare standpoint it is very difficult, if not impossible to supply a dairy cow in this climate (boldfaced by me to emphasize my point about the north country cold!) the nutrients and energy that she needs without some kind of grain supplement. It is not just the cold in the winter that attributes to this, but also the fact that it is very difficult to grow the really high energy forages here that they can grow out west. This is mostly due to our short growing season and often times rainy weather. I realize that there are dairy farmers in the area that are 100% grass-fed who would disagree with me, but they are wrong. It comes down to simple math - energy in, energy out, and understanding what a healthy cow is supposed to look like. I could go on and on, but what it comes down to is what all diets are about - moderation - grain in moderation. Many conventional dairies feed too much, 100% grass-fed feed none. I think people need to be aware that a happy medium does exist and that it is not fair to the cow to ask her to deplete herself so we can consume milk with a slightly better lipid profile." I love and respect information that comes directly from the hands, heart, mind, and soul doing the "work"! Ember and yoga... or yogurt, she's not fussy! 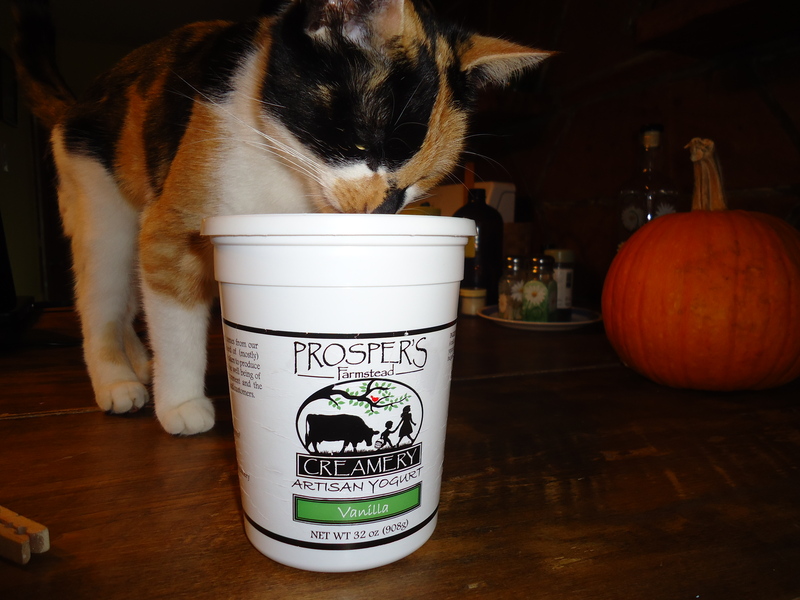 By the way, the Prosper's yogurt is available at Elliot's Agway in Winthrop, The Potsdam Food Coop, Nature's Storehouse in Canton, Martin's Farm Stand on Rt. 11B just outside of Potsdam, Martin's Store in Moira, and Nori's Village Market in Saranac Lake.